As Trixie got closer, she caught sight through a window of a red head bent over some early-morning task. Up here on the hill lived three red-haired men: Matthew Wheeler himself, Jim Frayne, and Regan. Trixie hoped that was Jim she saw. It was. Trixie forgot that her sneakered feet would give Jim no warning of her presence. She was only a few feet away from him when he noticed her and immediately dropped the town he been wiping his hands on. "Yikes!" He exclained. "Where'd you come from? And what brings you here so early?" "Hi!" Trixie blurted. Then she saw the clock near the tack room door. "Oh, jeepers, I lost track of the time. Gotta go!" She tossed the iron horseshoe onto a shelf and started racing back down the hill. A minutes later, Jim came whizzing behind her on his bicycle. As he caught up, he called, "Even though I'm not wild about your entrances and exits this morning, I'll give you a ride home if you give me breakfast." "It's a deal," Trixie agreed. Balancing on Jim's handlebars, Trixie enjoyed the cool morning air that struck her face. As Jim coasted down the steep, twisting path, trees and boulders flashed by. They came to the spot where she had picked up horseshoe. Had Jim hit it at this speed, they would have had a terrible accident. She pointed with her head and said, "That's where I found it." Jim leaned forward. "Found what?" The ghost writer of this book is thought to be Gladys Baker Bond. 1. "It's Not a Skunk"
The Beldens discover a young baby hidden in Reddy's dog house and the Bob-Whites become determined to find his parents and discover how the baby suffered the bruises and scrapes. Trixie is amazed when Sergeant Molinson asks for her help and when they find the parents, a bigger mystery becomes apparent: where is the baby's brother and who are the people who claim they have kidnapped the children? A puzzling mystery with a climatic ending and a joyous family reunion. Ella Kline - seamstress who lives at the Glen Road Inn. Roger Higgins and Sax Jenner. Roger tries to blackmail the Dodge's to re-pay a debt to Sax, who has just been released from prison. The book opens on a humid August night as Peter confides to Helen about David Dodge and his financial problems (p. 14-15). They have a property at Saw Mill River, which is between the Hudson River and White Plains. Trixie called for "Moms" and then "Mother" so Helen knew immediately that something was wrong (p. 26). Brian knows how to prepare baby food which surprises Trixie (p. 27) and Jim suggests they call the baby Moses (p. 41). Moses seems a popular name with the Bob-Whites as they also called the puppy Jim, Trixie and Honey found during the flood, Moses. Grandma Belden had planted the rose garden at Crabapple Farm, which is overlooked by the guest room window (p. 56). Trixie and Honey find themselves heading towards the Glen Road Inn - "an old Dutch mansion converted into a rural hotel" and Honey suggests they visit Ella Kline. 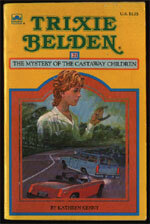 Both Ella and the Inn featured in the author's first book, The Mystery of the Uninvited Guest. There's some interesting trivia about a horse called Hambletonian that had fathered 1335 foals, and notes that there is a red granite obelisk in Chester marking his grave (p. 65-66) during Honey and Trixie's conversation with Ella. Honey accepts Ella's invitation to stay for lunch as Trixie hesitates, because Honey thought 'that Trixie was tactlessly putting her own desire to get back on the case over Ella's feelings' then turned to glare at Trixie. 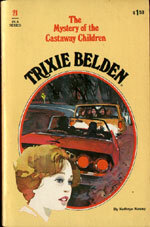 However, Trixie hesitated because she didn't know if Ella could afford it (p. 69). This is interesting as Honey is usually the thoughtful and perceptive one, but she jumps to the wrong conclusion here. Perhaps this is a good example of how their different upbringing and financial status makes them think in different ways. Di is said to have 'pansy coloured eyes' (p. 73). Trixie is surprised to see the human side of Sergeant Molinson. He accepts their invitation of ice cream (p. 79)and he is very compassionate when dealing with Eileen Dodge (p. 90). The only glaring inconsistency I could find was when Brian says that he doesn't know how to milk (p. 180) when in The Mystery at Bob-White Cave, he and Mart milk a cow. The author links the events nicely to past books and events and knows a lot about horses and horse care. She seems to flesh out her characters more than the other authors have and gives Trixie some interesting monologues.